The MultiDocker CH900F is a wheel-based material handler that provides unsurpassed mobility, incredible lift power, and speed of operation. All while delivering the reliability and efficiency that your operation depends on. The CH900F is “steady as a rock,” based on a heavy-duty 4WD undercarriage, and climbs tough terrain even while operating with loads. 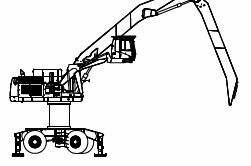 It offers multiple boom and stick combinations, SmartBoom technology, and integrated hydraulics, so configuring it to any job is possible. Best of all, it’s based on Caterpillar components, so you get the world-class reliability and service support you count on. The CH900F can handle any kind of operation: scrap metal, pulp logs, sawn wood, timber, chips, pellets, bags, aggregates, and most kinds of bulk and general cargo. Boom and stick: 3 combinations available from 59′ to 79′ reach. Integrated pipes. The boom and stick are designed for multi purpose use and can easily handle most different kind of cargoes. As an option we can offer a quick release coupling making the change between different work tools convenient and quick. Undercarriage: The most robust wheeled undercarriage in its class. 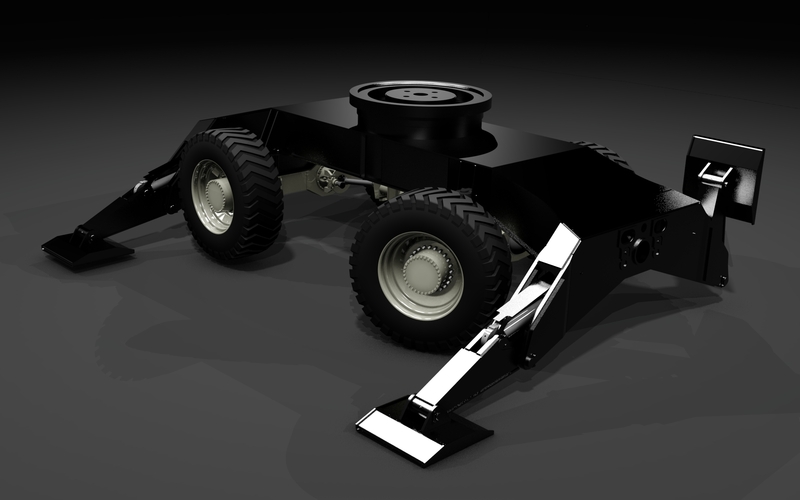 – 4WD wheeled undercarriage with heavy-duty construction. Safety cameras: 1 no. Caterpillar rear view camera, mounted on the counter weight integrated with the main monitor in the cabin. 1 no. camera mounted on stick. 1 no. monitor mounted in cabin. 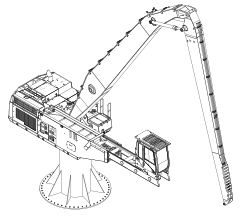 Lubrication system: Automatic greasing of the boom, stick and the swing bearing. Warranty: MultiDocker CH900F is delivered with a 12 month or 2 000 running hours’ warranty, whichever occurs first, to cover defects in materials or workmanship. Other options available. Movable 8m horizontally from the swing center. Designed for optimum visibility while loading/discharging vessels. Fixed, raised 1.5m for MH applications where view/height is crucial. Movable 8m horizontally from the swing center. Designed for optimum visibility while handling materials of all types. 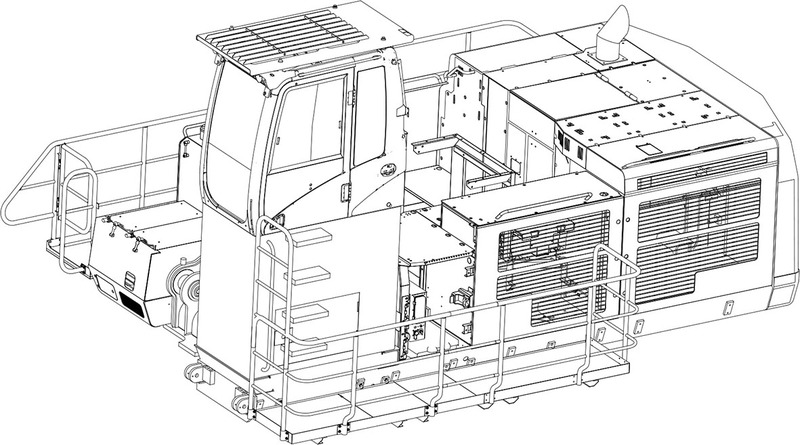 Select a cabin that meets the exact needs of your operation. Whether you need a Fixed cabin of Standard or Raised height, or whether you need an Elevating cabin for increased height and downward visibility, MultiDocker has a setup ready for you. Cab Design: The cabin has been designed to be spacious, quiet and comfortable for the operator, assuring high productivity throughout the entire workday. Switches are conveniently located for easy access. The monitor is located to provide excellent visibility and access. Seat: The seat provides a variety of adjustments, including fore/aft, height and weight to suit the operator. Adjustable armrests and a retractable seat belt are also included. For additional comfort, a new heated air suspension seat is available. Skylight: An enlarged skylight with sunshade provides excellent visibility and good ventilation. Hydraulic Activation Control Lever: The hydraulic activation control lever deactivates all hydraulic functions during engine start-up, and prevents unintentional machine movements. Climate Control: Positive filtered ventilation with a pressurized cab comes standard. Fresh air or re-circulated air can be selected with a switch on the left console. Monitor: The monitor has functions to display the machine, maintenance, diagnostic and prognostic information. The angle of the monitor can be adjusted to face the operator and prevent sun glare. The monitor also functions as display screen for the rear view camera that comes as standard on the MultiDocker. Cabin Safety System: The machine is equipped with an electronic safety system with motion control. The system prevents from collision between the cabin and the work tool. The system also controls the load in the machine to avoid overload. Cab Exterior: The exterior design uses thick steel tubing along the bottom perimeter of the cab, improving resistance fatigue and vibration. The cabin has an overhead protection frame (F.O.P.S = falling object protective system) bolted directly to the top of the cabin. Cab Mounts: The cabin shell is attached to the frame with viscous rubber cabin mounts, which dampen vibrations and sound levels while enhancing operator comfort. Wipers: Parallel wiper, including a washer nozzle is mounted below the cab windshield; this optimizes the operator’s viewing area and offers continuous and intermittent modes. Windows: To maximize visibility, all glass is affixed directly to the cab. The cabin solution CM8000 has a floor window as standard. This gives the operator the possibility to view the working area underneath the cabin. Consoles: Re-designed consoles feature a simple, functional design to reduce operator fatigue, ease of switch operation and excellent visibility. Both consoles have attached armrests and allow the height of the armrests to be adjusted. Standard Cab Equipment: To enhance operator comfort and productivity, the cab includes a lighter, drink holder, coat hook, service meter, FM Radio, literature holder, magazine rack and storage compartment. The cab can be equipped with optional 12 volt converter and up to 12V – 7amp electrical sockets to provide additional electrical resources. Sound: The operator sound level measured according to the procedures specified in ISO 6396:2008. Under normal conditions or the default condition, the monitor display screen is divided into four areas: clock and throttle dial, gauge, event display and multi-information display. Gauge Display: Three analogue gauges, fuel level, hydraulic oil temperature and coolant temperature, are displayed in this area. Multi-information Display: This area is reserved for displaying information that is convenient for the operator. The “Cat” logo mark is displayed when no information is available to display. Operator Gain/Response: This is used to suit the operators’ preferences or application. Toughest 4WD undercarriage in its class. 4 outriggers with protected hydraulics. Advanced Brake System. 100 Ton axles. Solid-tire option. Combination of 4WD Wheeled with pylon for greater reach and visibility. Safety catwalks and solid tires included in this configuration. Pylon, with height of 1-9 meters. 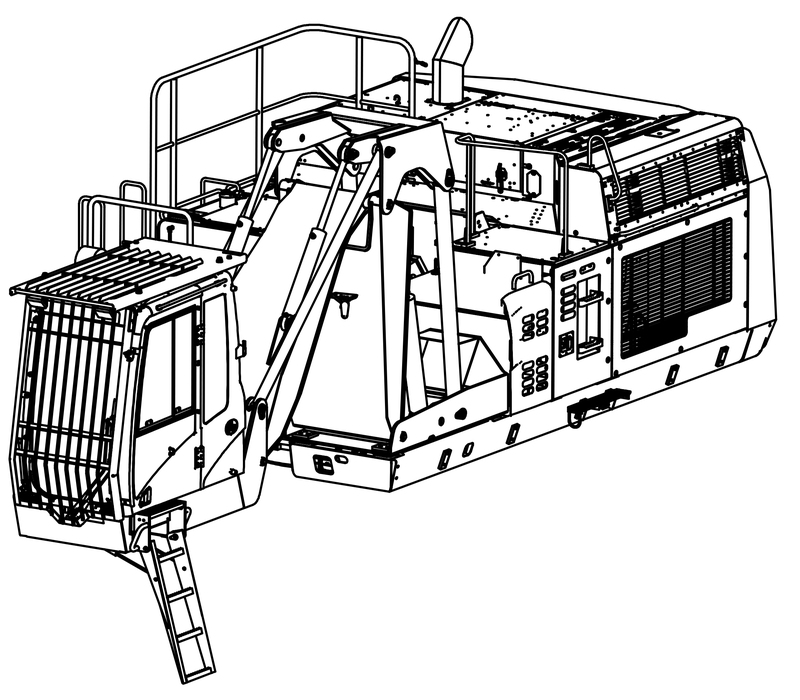 Depending on the customer’s needs, the MultiDocker CH900 can be delivered in various standard undercarriage configurations with crawler tracks. Other options are the rail track fitted gantry undercarriage or pedestal. It’s also possible to have the cargo handler installed onboard a vessel or a barge. Due to the unique module system we can tailor the height and width of the undercarriage raiser, the length of the track frames and the width of the flat shoes to meet special requirements in regards of weight, ground loadings, available space at the site etc. Sealed and Lubricated Rollers: Track rollers and idlers are sealed and lubricated for excellent service life. Idler Guards and Track Guides: Idler guards and centre track guides used to maintain alignment are standard. Track shoes: The flat shoe’s outer edges are curved and chamfered on the outer edges to further smooth transportation as well as prevent unnecessary damages to the ground. Being such a large material handler, the MultiDocker flat shoes cause very little effect to the ground surfaces. Due to the design of the MultiDocker bended flat shoes, they are very kind to all types of road surfaces, concrete, blocks or tarmac. Track: The MultiDocker cargo handler comes with grease lubricated tracks as standard. The track links are assembled and sealed with grease to decrease internal bushing wear, reduce travel noise and extend service life thus lowering operating costs. Travel Motor: Two-speed axial piston hydraulic motors provide the drive power and automatic speed selection when the high-speed position is selected. This enables the machine to automatically change between computer controlled high and low speeds depending on drawbar-pull requirements. Final Drives: The final drives are the three-stage reduction planetary type. This design provides a complete drive/brake unit that is compact and delivers excellent performance and reliability.